Iraqi special forces have joined the Mosul battle with a pre-dawn advance on a nearby town held by the Islamic State (IS) group, in a key part of a multi-pronged assault on eastern approaches to the besieged city. The addition of the elite troops, also known as counter-terrorism forces, marked a significant intensification of the fight for Iraq's second-largest city. As they advanced, attack helicopters fired on the militants and heavy gunfire echoed across the plains. 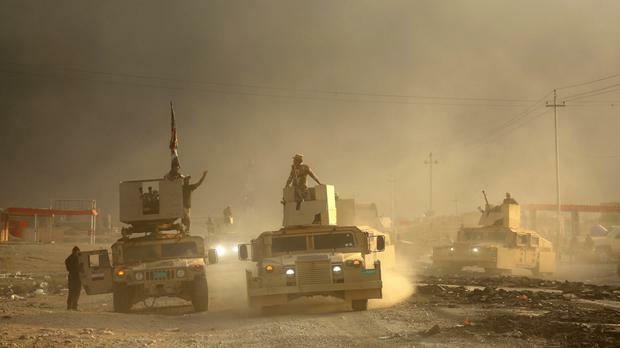 IS militants unleashed nine suicide car and truck bombs against the advancing troops, eight of which were destroyed before reaching their targets, while the ninth struck an armoured Humvee, Lt. Col Muntadhar al-Shimmari said. He did not give a casualty figure, but another officer said five soldiers were wounded. The special forces entered the town of Bartella, a traditionally Christian village that fell to IS in 2014, at around midday on Thursday. The fighting thus far has been concentrated in a cluster of towns and villages outside Mosul that are mostly uninhabited and littered with roadside bombs planted by the militants, which has slowed the Iraqi advance. Lt Gen Talib Shaghati said the special forces retook Bartella, about nine miles from the edge of Mosul. But Iraqi forces were facing stiff resistance inside the town shortly before he spoke. The Kurdish forces known as peshmerga, who are also taking part in the offensive, announced a "large-scale operation" to the north and north-east of Mosul on Thursday. "The operation will be in three fronts," the peshmerga said in a statement, and follows recent gains by the Kurds to the east of Mosul and Iraqi security forces to the south. Peshmerga forces stationed on mountains north-east of Mosul descended from their positions and charged toward the front line. They used bulldozers and other heavy equipment to fill trenches and moved armoured vehicles into the breach after about an hour of mortar and gunfire at IS positions below in the village of Barima. Military operations also appeared to be under way in the town of Bashiqa, north-east of Mosul. Thick smoke could be seen billowing from the town early on Thursday. A day earlier, Bashiqa was pounded by air strikes and mortar fire from peshmerga positions high above. The US military, meanwhile, said an American soldier died on Thursday from wounds sustained in a roadside bomb explosion in northern Iraq. It did not say where the blast took place or if the soldier was involved in the Mosul offensive. It marked the first American death since the Mosul operation began. More than 100 US special forces are embedded with Iraqi troops and hundreds more are supporting the offensive from staging bases. Iraqi Prime Minister Haider al-Abadi, speaking by video link to diplomats meeting in Paris, said the Mosul offensive was moving "more quickly than we thought". He also vowed to protect civilians fleeing the fighting and said the government "will not allow any violations of human rights". He said most residents of the region have welcomed the advancing forces. The IS group captured Mosul and the surrounding area during a lightning advance across northern Iraq in 2014, and IS leader Abu Bakr al-Baghdadi announced the formation of a self-styled caliphate from the pulpit of a Mosul mosque. Mosul is the largest city controlled by the extremists and their last major urban bastion in Iraq.